As we talked, it became clear that he didn’t actually think anything the article said was fake, but just thought that these representatives being denied entry was appropriate. It should have been easy to clarify this distinction with him, right? Well, I tried. I pointed out that the article shared quotes from ICE explaining why they made this choice and thought it was appropriate, in addition to the grievances of the CHC reps denied entry. I explained that that’s what news stories do: they share incidents that take place, and try to provide a clear picture of both sides of the issue. They might have bias, but we can compare news sources to examine that — and that doesn’t make them “fake news.” I reminded him that the term “fake news” came from literally invented news stories circulating during Trump’s campaign. I shared that of course we could disagree about whether this course of action was problematic (an opinion), but not whether the news story itself (which presented facts) was fake. You know exactly what happened. He insisted until the end that the news story was “fake news.” He provided no support. And at the end of the conversation, when there was nothing left for him to say, he resorted to trolling with snark. Y’all. It reminded me of this recent analysis of expressive responding. This sort of interaction is what birthed the I Changed My Mind series. I think we need to do a better job with nuance. I think we need to give people permission to qualify their views and change their views. Maybe you support a candidate but not everything they do. Maybe you support a political party in general but disapprove of its current trajectory. Maybe you started out believing in a viewpoint but now you have changed your mind. Maybe you currently support one idea but are open to evidence to sway your opinion. These are all examples of welcoming nuance. In a culture where we invalidate each other regularly, screaming LOUDER and MORE EMPHATICALLY and even denying facts that support opposing views are maladaptive tools in our toolkit. Modeling accepting nuance — and changing our minds — might help us train ourselves away from these reflexes. In the I Changed My Mind series, I’m going to share stories of times I changed my mind about significant beliefs, and I hope you’ll join me in the comments to share yours. Describing beliefs you no longer hold and your journey away from them makes you vulnerable for a lot of reasons. Some former beliefs may be embarrassing. Since we’re in flux, some of our views may be inconsistent with our other beliefs. Sometimes current views are scary to put down in black and white because you worry they aren’t “finished” enough — you’re still in process. To create a space where we can be gentle with one another and welcome this nuance, there are a few rules. First, don’t debate. There’s nothing wrong with disagreement, but that isn’t the purpose of this series, which is designed to showcase transformation. You can chime in to share similar stories if you see one that resonates with you, or to empathize, but not to argue. That’s it! I’ll start us off by sharing my own story in the next post. 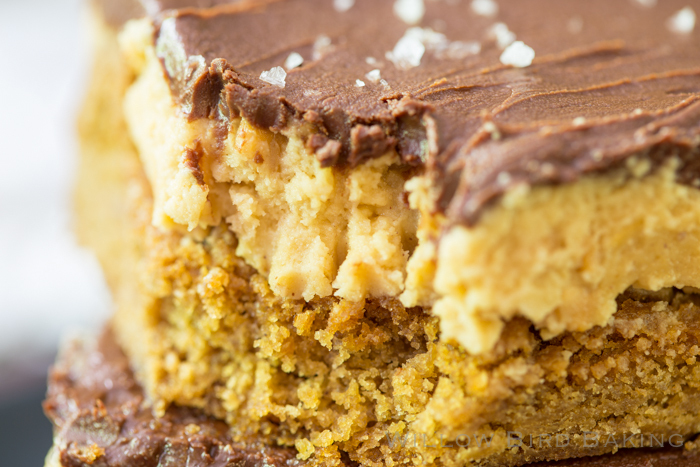 In the meantime, here are some Buckeye Peanut Butter Cookie Bars to hold you over! 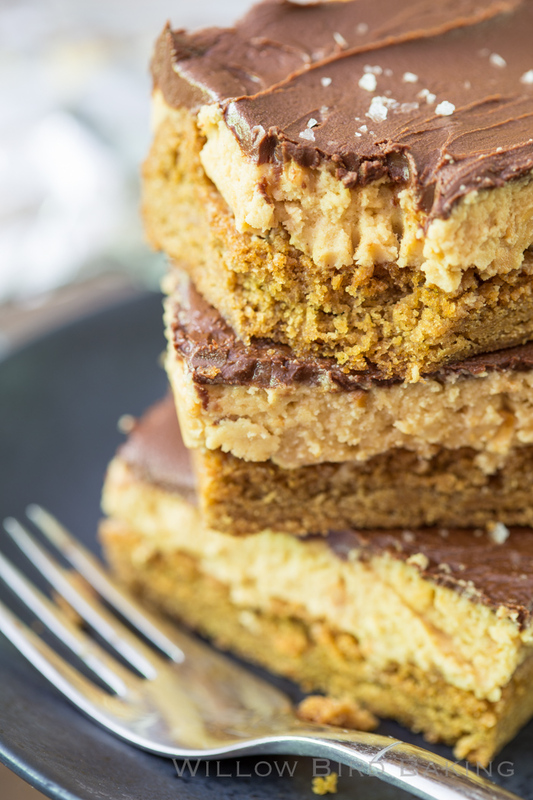 These Buckeye Peanut Butter Cookie Bars start with a crust made from prepared peanut butter cookie dough, pile it high with a buckeye peanut butter mixture, and top it off with chocolate! Using fair-trade chocolate doesn't change the taste of this delicious dessert, but knowing you're not contributing to slavery in the chocolate industry is SO worth it! Try these fair-trade chocolate chips (This is an Amazon affiliate link, which means I earn income if you make a purchase using this link. Thanks for supporting Willow Bird Baking!). Preheat oven to 350 degrees F. Prepare an 8-inch square baking pan with a foil sling sprayed lightly with cooking spray. 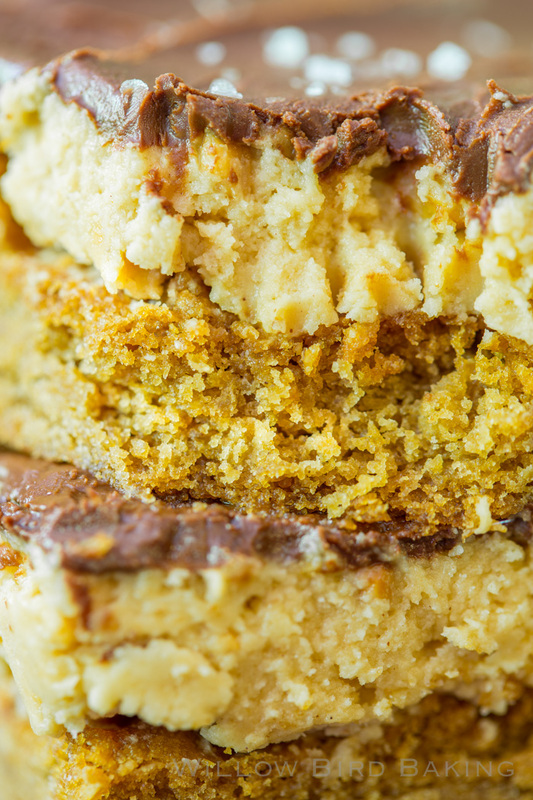 Press the prepared peanut butter cookie dough into the bottom of the pan in an even layer. 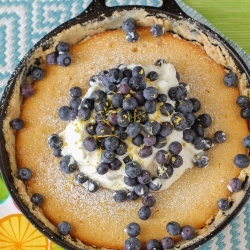 Bake for 18-22 minutes or until lightly browned. Let cool. In a medium bowl, beat together peanut butter, butter, and vanilla extract until smooth. Gradually beat in the powdered sugar until combined. Spread the peanut butter mixture over the cooled brownies. Melt the chocolate chips and butter together in the microwave on half power, stirring every 30 seconds, until smooth and completely melted. Pour the chocolate over the top of the peanut butter mixture and spread evenly. Top with peanut butter powder or Maldon sea salt flakes and serve. I look forward to this…..THANK YOU for caring!!!! I’ve always prided myself on having an open mind. I will listen to all sides of every story and then make my choice as to what I believe or want to be a part of. 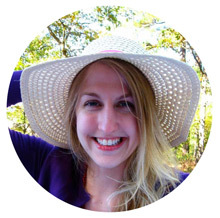 Loved your take on the “changing your mind.” It is so true. I have a sister-in-law who won’t even listen to another side of something. It is so frustrating! I love buckeyes and this looks soooooo good!